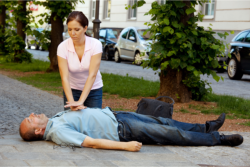 We offer caregivers and family members with the opportunity to learn First Aid and CPR. We can also facilitate certification renewals for anyone needing this course. Training sessions and classes will be conducted through our ASHI-Certified Training Center, Breath 4 U Training Center. We offer blended online courses and hands on training cutting training time down to 1 hour. For more inquiries, please call 301-690-9003.